﻿ TOCC is not for Everyone! TOCC is not for everyone. When we say this, we do not mean to say that we look down on anyone, judge anyone or step into other people's business and try to make them like us. We simply act in a Friendly, Respectful & Professional way, help others, and care about our neighbors. People who value these characteristics seem to love what we are and have supported our efforts to give back to our communities through charity events and shows. Tricked Out Car Club members have given over $26,000 directly to local charities through TOCC, and have helped our partner clubs do even more! As remarkable as this is, it is even more remarkable when realizing TOCC was founded March 2008! We spend our time in a positive way and this is just one testament to that statement! The club president has been motivated from day one to make TOCC the best COMMUNITY-BASED CAR & TRUCK CLUB in the world...and has never wavered from this goal. Along with the dedication of the members and club president, our officers have been quite the force and a big part of things too. In contrast, those people who break laws, abuse children, steal from their neighbors, and want to drench themselves in negativity & hate - well let's just say that we make those kinds of people extremely uncomfortable. They DO NOT LIKE US and we are okay with that. We still do not attack them, or regard them with malice, but we reserve the right to deny them membership in TOCC. Below are some words that float around TOCC regularly and ones that should sit well with you, if you wish to be a TOCC member. 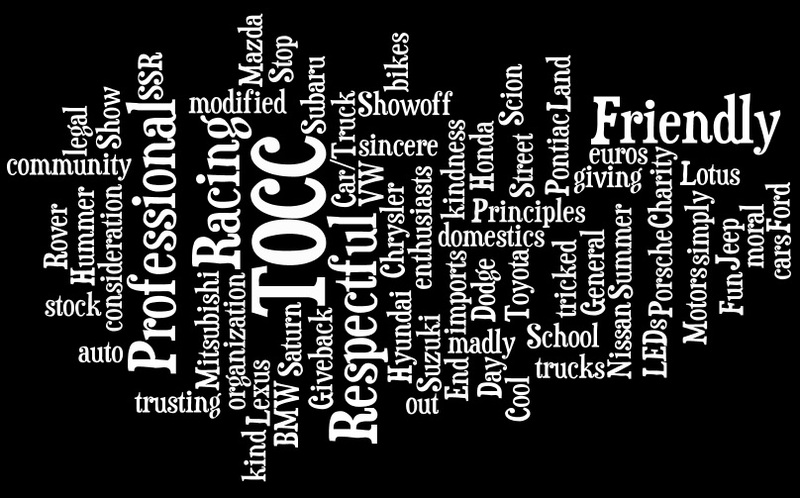 We hope that you will embrace these words and TOCC and help us in our journey to improve relations within the car club community whether your passion is Euros, Imports, Muscle Cars and/or Trucks, Motorcycles on everyone on wheels for that matter! We stand together, and invite you to stand with us, as we fight the good fight against all types of negativity, violence, ignorance, cruelty or hate. If you come across any negative words or actions against/related to TOCC and would like to share it with us, please use our Contact Us page. We do defend our name and we will reward you for your help! Facts trump lies, any day! Be safe & take care! Looking to join Tricked Out Car Club™ ?